The United States Department of the Treasury is selling "Lucky Money" for the Chinese New Year. The special one-dollar note comes with a series of numbers beginning with 8888. The number 8 is considered lucky in Chinese culture. 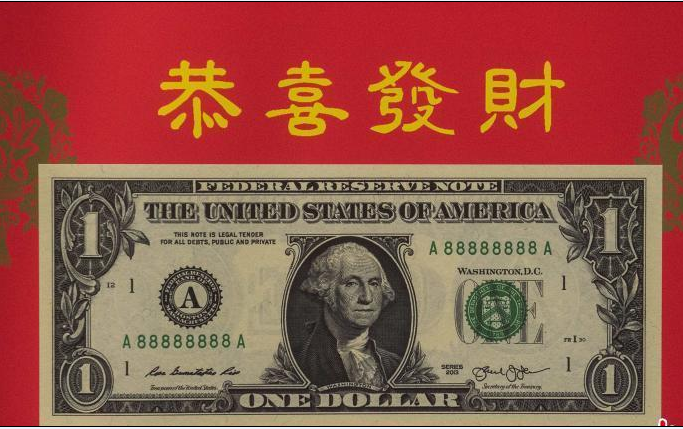 The special U.S. dollar comes in a bright red envelope, with Chinese symbols or lettering. The envelope has a picture of a colorful bird: a rooster. That makes sense. 2017 is the Year of the Rooster. The rooster is one of 12 signs connected with the Chinese Lunar Calendar. The Lucky Money Collection went on sale recently. Sales will continue until the Lucky Money collectibles sell out, even if that comes before the Chinese New Year. In 2017, the New Year will begin on January 28. Selling Chinese New Year products is nothing new for the U.S. government. Since the Year of the Dragon in 2000, the Treasury Department has sold Lucky Money collectibles. "It's extremely well received," said Leonard Olijar. He is director of the Treasury Department's Bureau of Engraving and Printing. He went on to say: "It's our most successful cultural product that we have. We expect we'll sell out in the first week of its release." Lydia Washington already has her Lucky Money. She believes it will bring her good luck. "I mean, it's pretty and shiny. What more can you ask? Lucky money products are awesome." The Treasury Department said it is limiting sales this year to 88,888 lucky dollars. That makes sense for a product connected to the lucky number, 8. Each Chinese New Year product sells for $5.95. They are sold through this website. If this makes sense to our leaders, then heaven help us all. I'm from Canada, our lucky number is 7. The proposals have been well received by many deputies. 1.The special one-dollar note comes with a series of numbers beginning with 8888. The students have put forward a series of questions. 2.The rooster is one of 12 signs connected with the Chinese Lunar Calendar. Suicide is often connected with socio-economic deprivation.